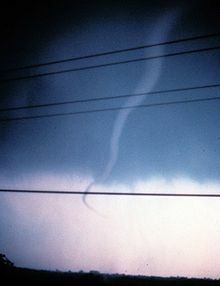 A tornado is a violently rotating column of air, in contact with the ground, either pendant from a cumuliform cloud or underneath a cumuliform cloud, and often (but not always) visible as a funnel cloud. 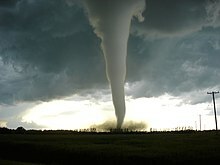 The are also referred to as twisters, cyclones and whirlwinds. Milder forms of similar air columns over land are known as dust-devils, and such occurrences over water are known as waterspouts. Rides in the whirlwind and directs the storm. When you told me you used to chase tornados I always thought it was a metaphor! Michael Crichton and Anne-Marie Martin, in Twister (1996). When the cloud, bloated with debris and tons of river mud, had passed over a slight rise of land to the east of the village, it left behind a landscape that passed beyond the bounds of despair into unreality. The handful of unscathed citizens from Griffin and surrounding districts were confronted with destruction so complete that some could only guess where they had once lived. The search for family and friends had a special hellishness, as fires flickered over the ruins and the injured wandered about in a daze, mud so thoroughly embedded in their skin that identification was all but impossible. Afterward, there was a lot of discussion about what people had thought it was. The noise had seemed to come from all corners of the sky at once. Journalists, armed with the thesaurus and apocalyptic scriptures, fumbled and were defeated by it. "A gulfy gulfy deliquescence of deranged and harnassed air"..."A volcano of the invisible, darkly contrued"… To the pleasure faithers with tiktok affections, it was the sound of clockworks uncoilding their springs and running down at a terrible speed. It was the release of vengeful energy. To the essentialists, it seemed as if the world had suddenely found itself too crammed with life, with cells splitting by the billions, molecules uncouplng to annihilation, atoms shuddering and juggernauting in their casings. To he superstitious it was the collapsing of time. It was the oozing of the ills of the world into one crepuscular muscle, intent on stabbing the world to its core for once and for all. To the more traditionally religious it was the blitzkrieg of vengeful angel armies, the awful name of the Unnamed God sounding itself at last — surprise — and the evaporation of all hopes for mercy. One or two pretended to think it was squadrons of flying dragons overhead, trained for attack, breaking the sky from its moorings by the thrash of tripartite wings. In the wake of the destruction it caused, no one had the hubris or courage (or the prior experience) to lie and claim to have known the act of terror for what it was: a wind twisted up in a vortical braid. In short: a tornado. If enough people were praying [God] would've intervened, you could pray, Jesus stilled the storm, you can still storms. Why did you build houses where tornadoes were apt to happen? Then the air was filled with 10,000 things. Boards, poles, cans, garments, stoves, whole sides of the little frame houses, in some cases the houses themselves, were picked up and smashed to earth. And living beings, too. A baby was blown from its mother’s arms. A cow, picked up by the wind, was hurled into the village restaurant. Then the wind struck the school. The walls seemed to fall in, all around us. Then the floor at one end of the building gave way. We all slipped or slid in that direction. If it hadn’t been for the seats it would have been like sliding down a cellar door. It is the public’s perception that their children are safe from tornadic wind events while at school because their school has an established tornado shelter. However, it may be a tornado shelter in name only; in fact, the only reason that area may be a “shelter” is because someone called it one. A tornado safer area designed by an experienced architectural and engineering team is essential in providing what FEMA has labeled “near-absolute” protection from tornadoes.